I can't believe with all the cooking I do that I've never made a quiche before! I don't know what I was afraid of - it was actually quite easy and came out INCREDIBLE!!! What prompted the quiche was the influx of fresh eggs we received both from a coworker and also from a neighbor of my sweetie's. So what's a girl to do? 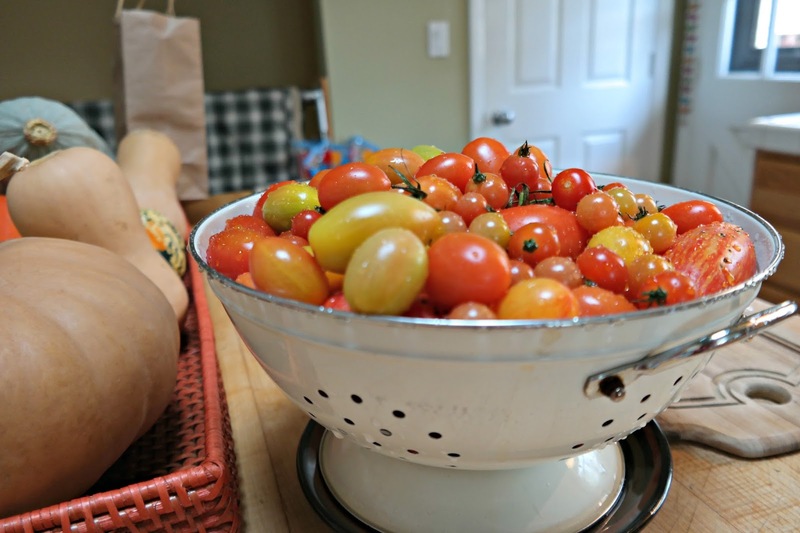 Our billions of green tomatoes have been ripening slowly and as they ripen I try to think of ways to incorporate them into our various meals. I decided to make another batch of that amazing Roasted Tomato Soup I made a while back and dinner would be soup and quiche. And some more soup for the freezer. Love that! 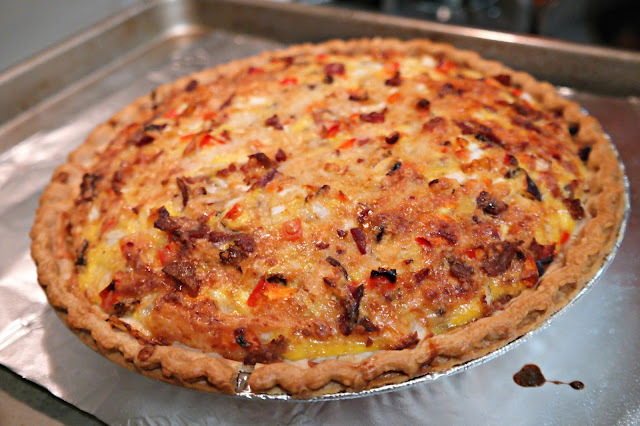 I wasn't quite sure how the quiche would turn out since it was my very first kiss I mean quiche. I was a quiche virgin. Sorry, I had to. Forgive me. 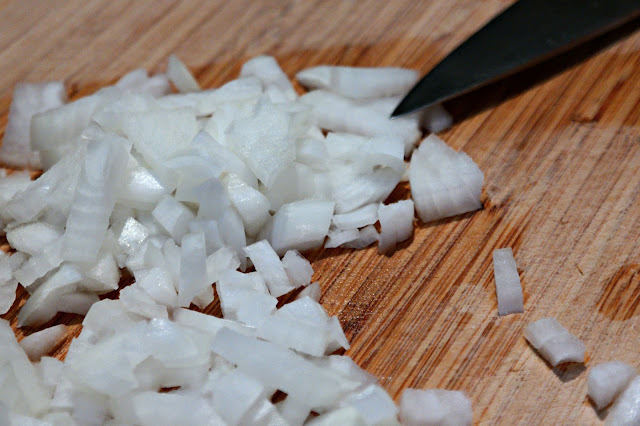 I started by dicing up 1 medium onion. 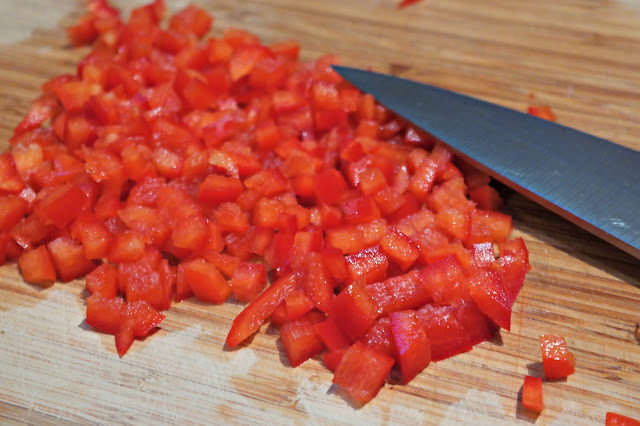 And a medium red pepper. And a handful of shiitake mushrooms, stems removed. Small dice on everything as I wasn't pre-cooking any of the veggies. And I didn't want big chunks of veggies, just evenly dispersed flavors. I mixed them all together in a bowl. And then came the bacon. Because, I mean, come on - hello - BACON!! The bacon was pre-cooked that morning with breakfast - I usually cook up the whole pound of bacon - this way it's only one mess in the kitchen yet multiple meals. 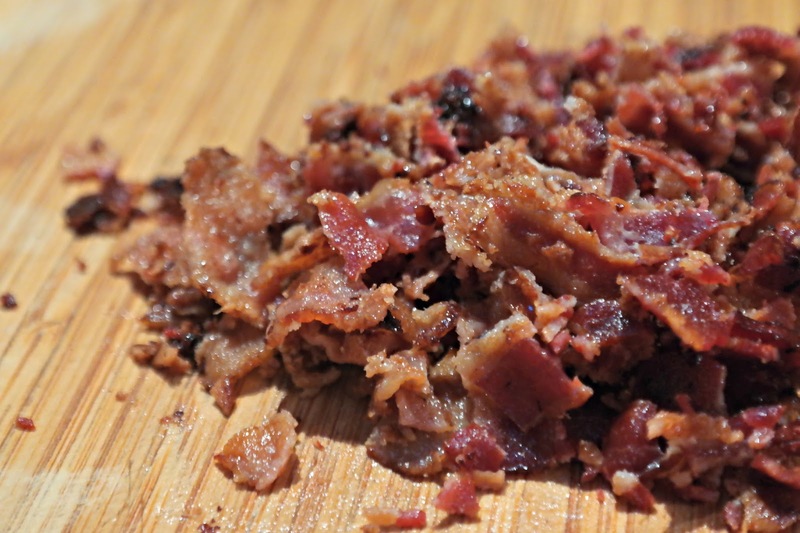 I stick the cooked bacon in a freezer bag and pop it into the freezer for bacon emergencies. What, you've never had a bacon emergency? Fess up. I think this was 4 or 5 slices of pre-cooked reduced sodium bacon. That's the only kind I buy. I got out my frozen pie crusts - yup, frozen. 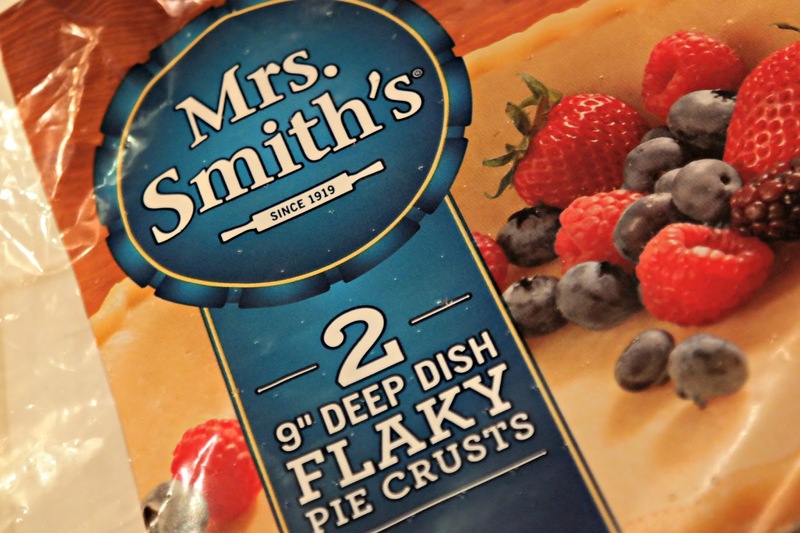 These are so good and so easy to use that I haven't made my own pie crusts in years. Centuries even. And there was cheese. Not sure why it didn't make the photos ....I may or may not have been too busy slicing off chunks and shoving them into my face. I love cheese even more than I love bacon. I used about 3/4 cup of grated Asiago and 1/2 cup of grated Swiss. 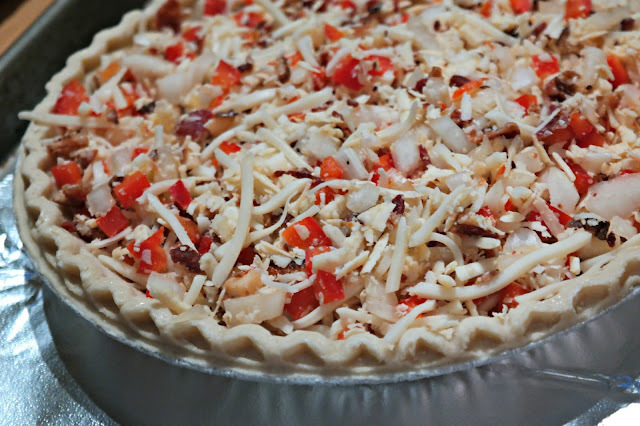 Mixed it with the veggies and the bacon in a bowl and then dumped it into a frozen pie crust. The oven was already good and hot since I was roasting the tomatoes for the soup. 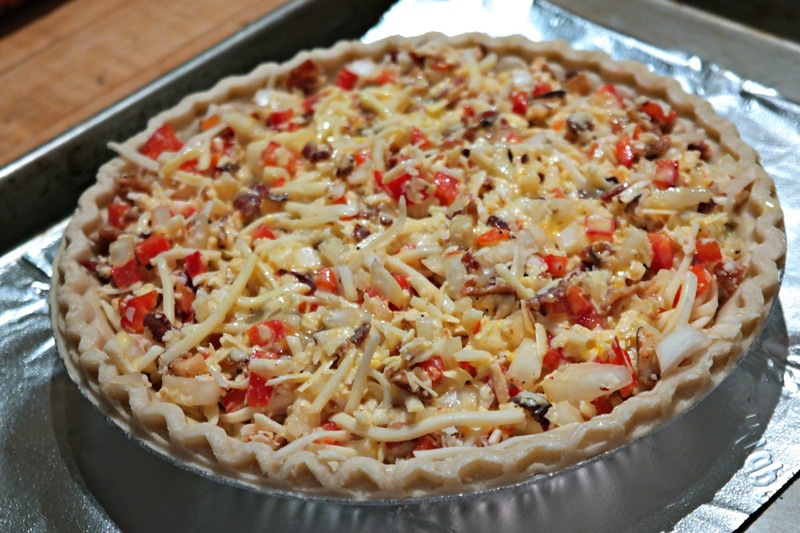 When I took the tomatoes out I raised the oven to 400 to get it ready for the quiche. I took 5 of my fresh eggs (they weren't large, if you have large or jumbo 4 may be enough) and whipped them up with a cup of organic half and half and some salt and pepper. And poured them right on top of all that gorgeousness. Sorry about the shadow - that was my head drooling over the bacon. Into the oven on a foil lined baking sheet for 15 minutes at 400, then dropped the temp down to 350 and cooked it another 35 minutes. And then we had this. I let it cool for about 15 minutes before serving. The quiche and the roasted tomato soup complemented each other so amazingly well it was frightening. Scary good, even - just right for a Halloween night supper. 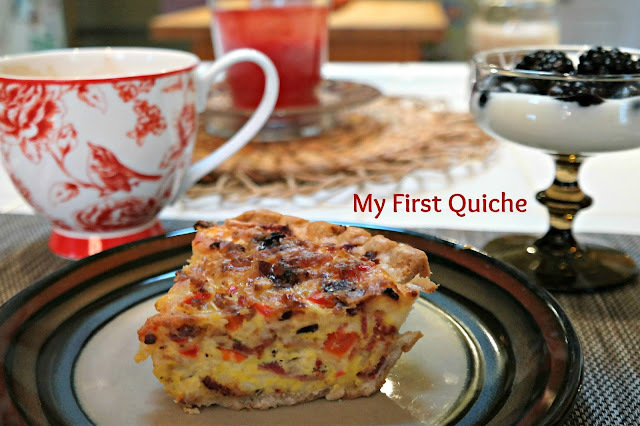 I encourage you to try making a quiche - it was so fantastic we didn't even mind eating it again for breakfast this morning with a little yogurt and berries and my home made cappuccino. And it was super easy!! 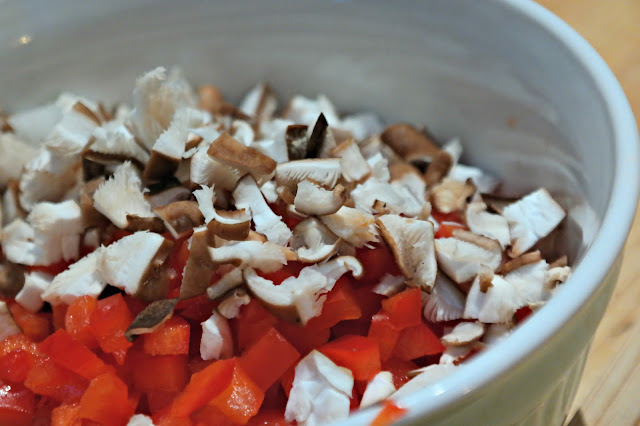 Dice onion, pepper, and mushroom and mix together in a medium bowl. Dice the pre-cooked bacon and mix with the veggies in the bowl. Whip the eggs and half & half together with salt and pepper to taste. I left out the salt and don't think this dish needs any additional salt - you get enough from the bacon and the cheese. Bake at 400" for 15 minutes then reduce heat to 350 and bake for an additional 35 minutes. Let cool for about 10 minutes prior to serving. Happy Sunday, my sweet friend! And I LOVED this comment!! Thanks so much, Mimi - your sweet comment means the world to a new blogger like me!! Ha ha "French Kid Pizza" that's awesome - what a great idea! Hope you like the recipe....and have a great Sunday my new friend!! The great thing is that you can swap out the ingredients to suit your tastes and I think it would still be pretty amazing! I would try it first by finding a recipe that has ingredients you like and then play around with it until you find the combination of flavors you love. Thanks for coming for a visit!! I used to make it. I wonder if I could put those foil pie plates in my Breville Smart Oven... I LOVE quiche. Yayyy I finally posted a recipe that inspires you, Brenda!!! Yes, you can definitely put those foil plates in your toaster oven. You may just need to do a little google search to see how you have to adjust the time and/or temp with your Breville oven vs a standard oven. And you could totally leave out the bacon since you don't eat meat! Let me know if you make this and how it works out for you! Welcome!! 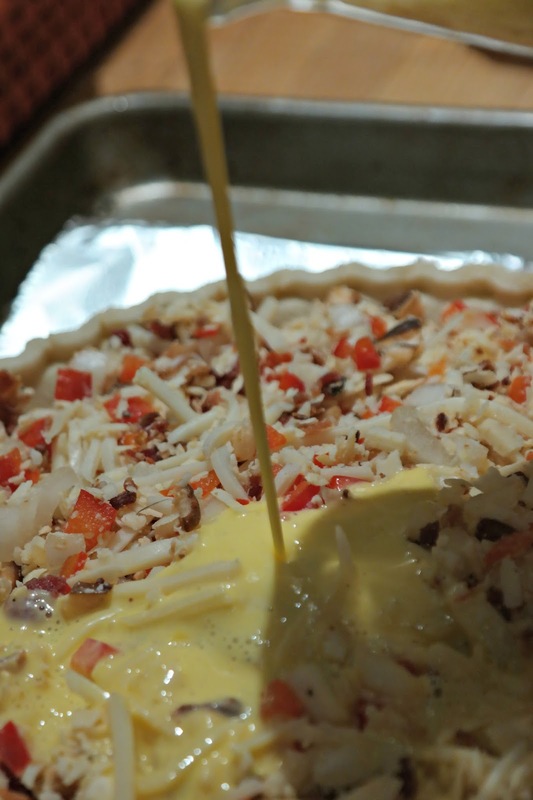 Quiche is one of my favorite go to, easy suppers. You really can't goof it up. I hope you are right, Stacey, because now my head is spinning with a bunch of different combinations of flavors I want to try! Amazing recipe there! Looks so so YUM! I'm a new reader and wanted to say howdy and letcha know I'd been here. I am enjoying your pretty blog and all the neat pictures and interesting adventures, and hearing about your home! I blog from Charleston, stop by sometime! Thank you very much for stopping by and saying hi!! I'll have to pop on over for a visit your way also! Thanks, Deb! Broccoli cheese sounds great also....I"m thinking spinach, roasted red pepper and either feta or goat cheese might be a future experiment over here. Stay tuned for that one! Oh girl, we love our quiches here in Texas! Seriously though I raised 4 kids on frequent quiches and now they do the same with their youngsters. I love them and they also are great for a Ladies luncheon! These would be fabulous for a ladies luncheon, you are so right, Jemma! My daughter brought the last piece to work today and sent me the nicest email about how much she enjoyed it - which made it ok that she stole my lunch!! :) As she said - #sorrynotsorry - ha ha! Only kidding, she asked me if it was ok that she took it so all is well! It looks delicious, and easy to make as well. I don't think my husband is a fan of quiche, but gosh.... I would LOVE that! Hey, you never know - give it a try and see if he likes it - what's not to like? Bacon? Cheese? Eggs? Yummmmm!! I made your quiche and it was very good. Never made one before and because hubby doesn't like mushrooms, I left them out and I added serrano peppers. He surprised me and liked it! Now I am going to heat up left overs for supper tonight and wondered how you reheated yours? Oh, how exciting, I'm so glad you shared your feedback!! I actually don't like mushrooms either but when I cut them tiny enough I can forget they are there! As for reheating, Quiche is one of those things that can be served at room temp so it doesn't need a ton of heating. You could wrap it in foil and put it in the oven for a bit or even put a slice in the microwave for about 30 seconds or so. I'm so glad you enjoyed it!! It was good all over again! Thanks again.